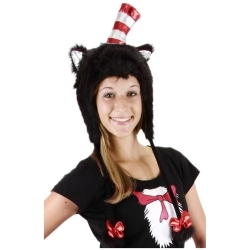 The Cat in the Hat hoodie hat is a great way to quickly dress-up as The Cat in the Hat for Halloween or Dr. Seuss themed costume parties. The Cat in the Hat Hoodie Hat is colored as pictured. Hoodie hat will fit up to a 23 ½" head measurement.